Day 250: Another International Pie! Last evening my daughter Alexandra was packing her bags to get ready for her flight to Denmark today. We watched her pack the gifts that she bought for her friends and then watched her weigh the bag after each addition because she was worried that she might go over the airline’s weight limit. While that was going on in the back room, I got busy in the kitchen. I prepared pie dough – this time with no whole wheat flour – and made the crust and placed it in the pie tin. Then for the first time, I used my new ceramic “pie beans” to pre-bake the crust – a gift from my friend Gina. Once the crust was done, I let it cool on the counter while I prepared brownie batter. Then, in a flash, the brownie pie was in the oven. After the pie was done, I let it cool and then wrapped it in plastic wrap and placed it in the freezer so that it would be firm enough for travel. And about this time, the pie is in a bag next to Alex and she should be somewhere near Greenland, hopefully fast asleep. 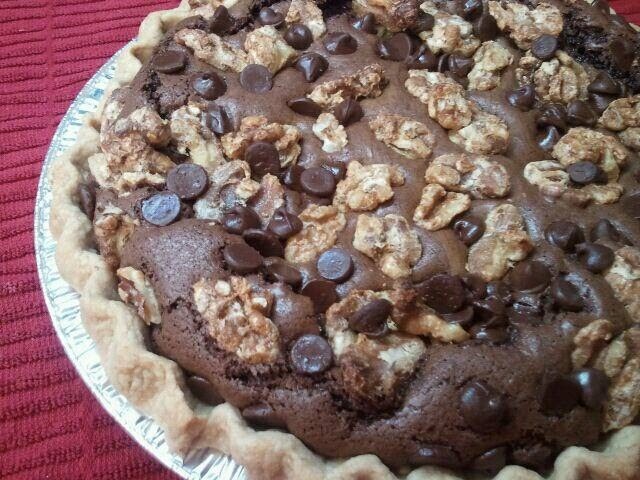 This brownie pie is a gift for her boyfriend Kristian, and his father Ole. They have both been hinting about getting a pie since this pie voyage began but I was hesitant to send one in the mail as it might have taken seven days and that would never do. 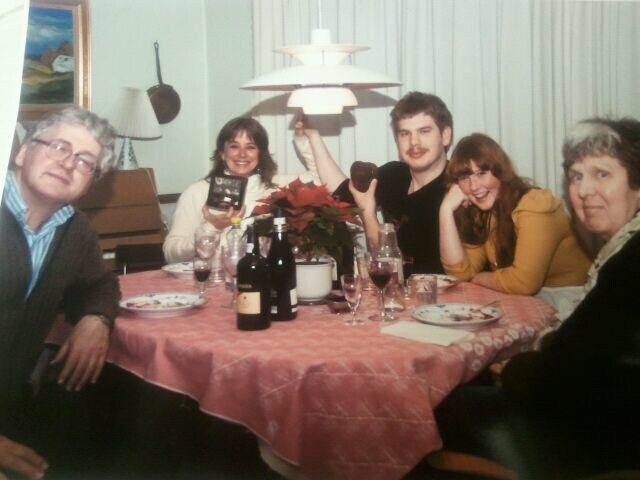 After all, when I visited Denmark last December Ole spent hours preparing a fabulous feast for Alex and me that was topped off with a traditional Danish dessert called Ris ala mande. What is special about this dessert is that there is a whole almond hidden in the pudding and the person who finds it receives an extra gift. Well, neither Alex or I knew that and found it peculiar that Ole kept serving the pudding and then taking it back before we had a chance to eat it. It seems he had forgotten which plate contained the extra almonds (yes he had hidden two!) and he wasn’t satisfied until Alex and I both found an almond in our pudding. For “finding” the almonds, Ole gave us each a small box of chocolates. It was so silly but so sweet to include us in this tradition. Ole took this photo of us enjoying Ris ala Mande using a tripod. Today, I sent Ole and Kristian a Brownie Pie with lots of love and good wishes for the holidays…. and for the years to come. It. was. delicious!! We’ve been enjoying it all week. So glad you liked it… even if it was a bit gooey! Sending love and hugs across the miles.